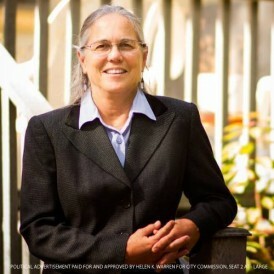 Local activist, Realtor and out lesbian candidate Helen Warren, 60, beat Annie Orlando in a run-off for Gainesville City Commission At-large Seat 2. Warren’s win in notable as she won in the traditionally conservative state of Florida. Warren has been active in her community for decades with Audubon of Florida, serving as president of the Alachua Audubon Society. Additionally, she’s worked for LGBT rights wtih Equality Florida. She’s also a Realtor with Prudential Trend Realty and is on the task force for Plum Creek’s Envision Alachua planning process. Now Warren, 60, is making her first run for elected office. She is campaigning for the at-large seat on the Gainesville City Commission up in March’s election. Posted April 9th, 2014 & filed under News, Politics.